The Concept: Back in the 1970s, there were two fit young guys who went running together in Edinburgh, David Salmond and Alan Lawson. One day DS came across a guide-book to Edinburgh which used the phrase ‘seven hills’, so they investigated the possibility of creating a route which included them all. After some adjustments, the current route was fixed upon. Race Personnel: Of the race’s originators, David Salmond died of leukemia in 1994; Alan Lawson continues as the main organiser, helped by many friends and relations who have both run and assisted over the years. The course is a combination of road-running, cross-country, hill-running, and urban orienteering. The total distance is a little over 14 miles, and there’s about 2200 feet of ascent/descent. There are, unfortunately, many road-crossings, quite a few of them major roads. There are five water-stations on the course; these are at or near the checkpoints. They have water, orange squash, and sultanas; they also have first-aid kits. Route-finding: choosing the optimal route is all part of the event, and the course does change slightly over the years, due to growing shrubbery, altered field-use, increasing road-traffic, and hill-erosion. In the fortnight before each year’s event, it is common to find entrants out on the course evaluating the options. Harvey’s useful Edinburgh Seven Hills Map is displayed on the day at Calton Hill (it can be bought in map-shops). Route guide: For those unfamiliar with the fine detail of Edinburgh’s geography, the website has a detailed rough guide for getting safely round the course. Faster runners may find a quicker route! a Race trophy and a Women’s trophy. These consist of pieces of volcanic lava from Arthur’s Seat. There is also a Male Vet (over 50) trophy, and a Female Vet (over 45) trophy. Old rocks for old crocks! For those especially-heroic runners who complete ‘the double’ for the year — The Edinburgh Marathon AND The Seven Hills of Edinburgh — there’s a whisky miniature. There are also many other prizes, including age-category ones. Seven Dutch runners are entered once again in 2016. On the night before the event, a barbecue is staged for all overseas entrants. In recent years this has been held at the Midmar Allotments, beside Blackford Hill. Williams Brothers excellent beers are normally served. Portobello Runners is the top club for supporting the event. Their website is also impressive. The Southside Six is the equivalent event in Glasgow. 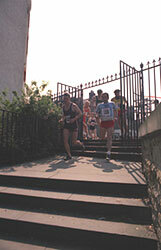 Viewing-point: In the 1990s, an information-board was erected at the top of Braid Hill, specifically describing the seven hills which make up the course. The prime mover of this initiative was John Bartholomew, of the famous map-making company. Special Map: A special Seven Hills map has been commercially produced, and is available in many Edinburgh bookshops. It is produced by Harvey’s of Doune (tel. 01786-841202), and gives a detailed depiction of each hill. Fireworks: The organisers of Edinburgh’s Hogmanay celebrations have taken up the seven hills theme; fireworks are set off from each of the hills at midnight, to welcome in the new year. Music: In 1988, a musical composition by Neil Butterworth entitled “The Seven Hills March” was played at the tops of the 7 hills by members of the Edinburgh Youth Orchestra. Television: The event has featured once on television. Channel 4’s sport department appeared in 1997 — the only year the event has ever suffered from heavy rain! 2005 Stewart Whitlie Gillian Godfree Werner Kittel ? Postal entries are accepted up until 5 days before the event, if places are still available. Portobellorunners.co.uk/archived-reports-to-august-2010 has reports by successful participants. For example, look up 2008 and scroll down to find ‘Recce of 7 Hills Route’ and ‘Seven Hills report’. “A week after I (Colin Youngson) had finished second in the Scottish marathon championship, my skinny legs were still tired and a bit sore, but this event seemed a great innovation and could not be missed. 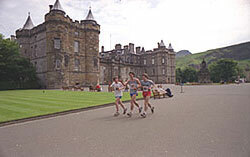 The original route actually started inside the walls of Edinburgh Castle, so competitors did not actually have to run up the first hill! Instead, we poured through a gap and down steep, narrow, winding paths, out through Princes Street Gardens and turned left. Down to Haymarket, straight on for a while, and eventually a slanting right turn onto a long gradual road hill which took us up to the top of Corstorphine Hill. By now, my redoubtable road running rival, Sandy Keith, was drawing away, moving strongly. I suspect he had a clear idea about the precise route, unlike myself, who possessed only a hazy notion. I just wanted to get round, hopefully avoiding defeat by many new rivals! As Sandy disappeared, never to be seen again, until the finish, I overshot the hill and belted down a road to the left. As I reached the main Corstorphine Road, I was mildly dismayed to note four of my training mates sneaking out through the Zoo gates. Ah, well. Since my orienteering skills were obviously lacking, I decided to tag along for a while. My Edinburgh-savvy companions, including Dave Logue and Davie Watson, did not, as rumour had suggested, cut into people’s front gardens, muscle straight through their houses and escape via back gates, but cunning shortcuts were used. I waited patiently until we reached ground which seemed more familiar, from racing or training. Approaching Craiglockhart, I mused about the great poets Wilfred Owen and Siegfried Sassoon meeting in the hospital there during World War One. Up and over: no problem if you are merely following! Braid Hill was better-known, since it was Edinburgh University’s home cross-country course, which I had raced often, back in the late 1960s, while I was an Aberdeen University harrier. From the top, one could see Blackford Hill Observatory. On the climb up Blackford, I tried a little harder and, fairly confident of navigating round the rest of the race, edged away from my friends. Somehow I found an adequately direct route to Arthur’s Seat, and then had to pick one of several paths to the summit. Luckily I selected a good one. It was hard work scrambling up to the trig point, but then came the dodgy bit. 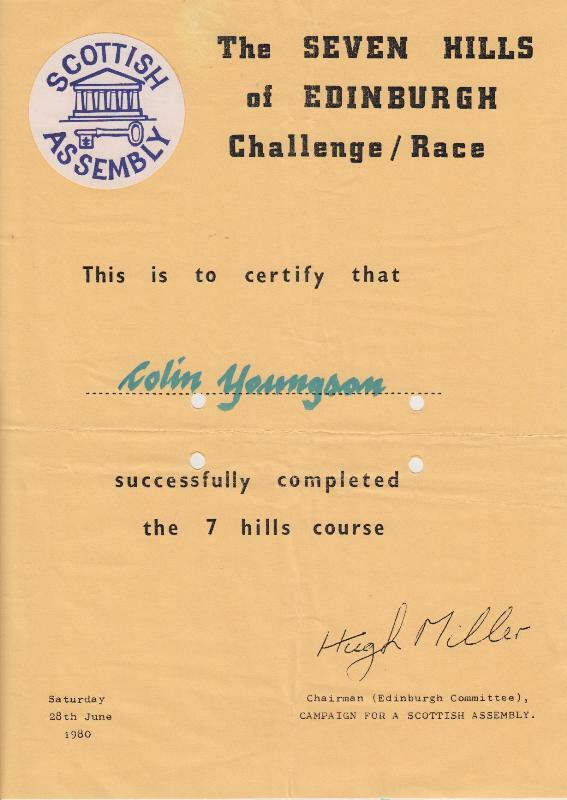 My downhill running was very amateurish – partly because of fear and lack of suitable quad strength, but mainly because I had not undergone the lobotomy operation, which was essential if one were to become a good hill runner! Ross Houston, who is at present one of the finest distance runners in Scotland, won the race in 2011 and 2013 and remembers the following. “I ran the 7 Hills Race twice, in 2011 and in 2013. In both years, I was looking for something a bit different after building up to and running spring marathons (Edinburgh in ’11 and London in ’13). Since the event was in my back yard, and combined road running with some less familiar off-road scrambling and hill climbing, this was an obvious choice. In 2011, I prepared quite meticulously, studying maps and going for several recce runs, sometimes with other runners with more route knowledge than myself (e.g. Tom Ferrington). I had it all planned, but remained a bit nervous about particular sections, such as trying to squeeze through the bars of the gate at Pollock Halls, and not really knowing the route up Arthur’s Seat (how difficult can it be? – very, as it turns out). I was also aware of other key route decisions, such as whether to charge straight over Braid Burn or to take a longer but safer route over a bridge (charged over the burn in the end). The race started with an excellent atmosphere. There is something unusual and a bit special about dashing over North Bridge in a large group of runners, as motorists and tourists stare in awe / astonishment. I was actually quite far back down the field at the Castle, but steadily moved through and had taken the lead by the time we approached Corstorphine Hill. The run from Corstorphine to Craiglockhart is straightforward, albeit runners need their wits about them for road crossings. The climb up Craiglockhart Hill is bloody hard, but nearly manageable if underfoot conditions are kind. In the wet, wearing racing flats, it’s a nightmare! Sneaking through the aptly named ‘fly walk’ towards Braidburn Park, a more gradual climb to the Braids was rewarded with outstanding views and a fast descent to follow. I decided to take the safe (but stupid) option of running round, rather than through, Pollock Halls, which probably added a good 30 seconds. Then the climb up Arthur’s Seat was a case of applying the logic that if I kept going up then I’d get there eventually. After kindly requesting tourists to allow me some space to reach the checkpoint on the summit, there was another fast descent to the palace, before the sting in the tail up to Calton Hill. A load of pink ladies were circulating Arthur’s Seat as part of a fun run, and the second placed runner in the 7 Hills (Al Anthony) had an ‘incident’ , while trying to dodge spectators and their not-fully-under-control canine friends. Rhona Anderson, who recently won the W45 race twice, wrote the following. “2014 was my first time running the event. This was great fun and a bit of an adventure as I wasn’t entirely sure of the route. I definitely went a long way round after the Braid Hills golf course, as runners behind me were then ahead on Blackford Hill! 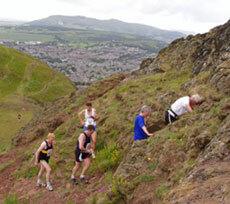 I followed some Dutch runners up a very steep climb on rocks up Arthur’s Seat, which was not for the faint hearted! My descent back and across Holyrood Park was definitely not the most direct but I made it back to Calton Hill. There are also two articles about a pint-drinking version of this race!